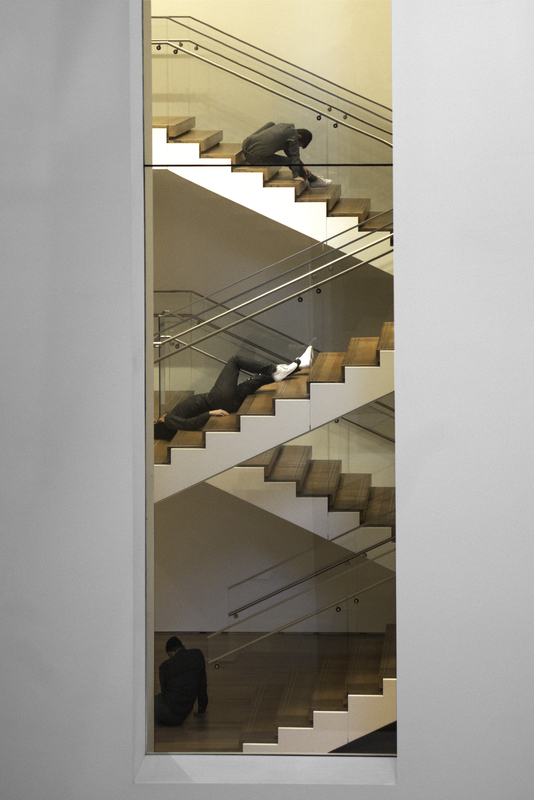 “I am concerned with the separation between the spectacular and the everyday, between subject and object, between bystander and viewer—while addressing the ways in which dance and the spectacle of performance are presented in theatrical and exhibition contexts.” For Maria Hassabi’s Walker-commissioned performance STAGING (2017)—performed continuously during gallery hours, February 8–12 and 14–19, 2017—eight dancers will inhabit various locations within the Walker Art Center, including the galleries of Merce Cunningham: Common Time, creating a sculptural movement installation. Occupying a space between live performance and visual art, her art explores the tension between human form and artistic object through stillness and sustained motion. Here, in an interview with curator Aram Moshayedi, first published in the Walker-designed catalogue Merce Cunningham: Common Time, Hassabi discusses her live-installation work, her approach to institutional spaces and the body, and the relationship between the spectacular and the intimate. Aram Moshayedi: It makes sense to begin our conversation with PLASTIC (2015), a work that you first presented at the Hammer Museum for a month in February 2015. As an “installation” of choreographed movement for four performers, it’s a work that inhabits slowness. In some sense, it relies on its performers to move almost glacially or tectonically slow. This characteristic was something that I was first drawn to when I saw you perform Intermission (2013) at the 55th Venice Biennale as part of the Cyprus and Lithuania Pavilion. Can you talk about the relationship between these two works and any conceptual ties that bind them? Maria Hassabi: Both PLASTIC and Intermission belong to the format I call “live-installation.” This is a term I coined in collaboration with my team, Hristoula Harakas and Paige Martin, when we were asked in Venice to describe the kind of work we were presenting. In principle, live-installations have an ongoing presence in an exhibition space, and their duration is determined by the opening hours of the institutions in which they are presented. These works lack any dramaturgical arc (usually necessary in theater), as there’s no definite beginning and ending. My works in general are characterized by their slowness, even though slow per se has never been my concern. I’m interested in creating a space where the viewer is given plenty of time to see and be, a space where even the smallest details of motion can become visible. In order to do so, I pare down my material and slow its rhythm. For a long time now I have been preoccupied with stillness and the paradox of this idea in live performance. Working with stillness, and finding a way to support it, has turned my attention toward how to move, uninterrupted, from one place of hold to another (which can result in a “tectonic” appearance). I find the only way to succeed in this un-interruption is to approach movement very precisely, with full awareness of its image. The performers need to be aware of the representations their bodies are producing at any given moment. This takes time, both for the performer to inhabit this awareness and for the viewer to observe it. This approach results in material that is detached from more typical rhythmical patterns. I try as much as possible to avoid any accentuated rhythms in my work, as that tends to create a hierarchy among movements, and can inadvertently turn the attention of the viewer toward a search for meaning. Moshayedi: Given that the commitment of time and the expectations of viewership are different in works presented in a theater, such as PREMIERE, would you say your interest in “the image” still applies? I ask because, in some sense, the experience of static images also lacks any determined duration. Hassabi: Yes, definitely, it applies. When my works are presented in a theater, I’m still dealing with images and their representation. I consider dance to be an abstract art form, yet it is one that is represented by human beings. The material of dance is people. This means that dance cannot avoid representation, especially with works like mine that tend to be so static. In terms of time and expectation, I think the biggest difference between a theater work like PREMIERE and a live-installation like PLASTIC is the nature of the tension between performer and audience. The closed space of a theater contains anticipation in a very particular way—the audience and performers are locked together for a shared experience that lasts for a specific duration. In an exhibition context, performers are present at all times, while the “visitors” come and go as they wish. This removes the nervous tension the performers usually carry within a theatrical presentation, which in my works doesn’t evaporate easily. Also, in my theatrical works I tend to exaggerate the idea of seeing, theater being the seeing place, by adding lights that are very bright and are treated as another sculptural entity in the space. They also produce a lot of heat that is felt throughout the duration of the work and intensifies the shared experience within the enclosed space. This is an element that I don’t involve in live-installations, even though at the Hammer iteration of PLASTIC an idea of this was materialized in the gallery space. So works like PLASTIC and Intermission tend to be less about the tension created and rather about the constant presence of the performers in the space. Moshayedi: How does the idea of an image translate specifically to your conception of the choreography and the role of the performers you’re working with? Hassabi: When I began creating PLASTIC, for example, there were specific images I had in mind as well as concepts—rounded torsos, a falling body, an overall plasticity of the body. There were also specific images of sculptures made by other artists that were very present in my mind while I was creating the movement. One in particular came from a conversation with you while we were looking at an exhibition of three solid stainless steel figurative sculptures by Charles Ray at the Matthew Marks Gallery in New York. For some works, including both PLASTIC and Intermission, I first make the material myself—they are solos, after all—and later on I teach it to the dancers. This gives me the opportunity to understand the images I’m thinking of and to really explore their physicality at a point when I’m not yet ready to articulate ideas very clearly to my collaborators. So I work alone for a while, and once things become clearer the collaborators come into the process. Everything changes immensely once they translate the movement I’ve created. Each physical body is very different, with its own limitations, abilities, and temperaments, and this is something I find very exciting, as it brings information into the process that I could not develop on my own. As far as the people I choose to work with, I’m drawn to them instinctively, while being aware of their technical capacities. I also pay attention to gender, ethnicity, age, and body type, as those are critical aspects of the images created. That said, some of my collaborators are consistent, such as Hristoula Harakas, who has performed in my work since 2002. Moshayedi: This attention to both the technical ability and “look” of your dancers is an interesting one. In her book on Yvonne Rainer, Carrie Lambert-Beatty makes a distinction between Merce Cunningham’s company and Judson Dance Theater on the grounds of pace—how the pedestrian pace of a choreography by, say, Steve Paxton, or the slow-motion movement between poses in another by Yvonne Rainer, might lack the surprise, glamour, and sparkle (in Paxton’s words) of a work by Cunningham.1 How relevant is this tension today? Are there trajectories of dance that are more loyal to one lineage and theory of movement than the other? Hassabi: I suppose there are, but honestly I’m not so concerned with historicizing my work in any way. I make the work I make. Yes, it has its influences—in fact, all the names you mention have influenced what I make today: the pedestrianism of Judson, Cunningham’s approach to time-space. And you know, I never really found Cunningham’s work to be “glammed-up.” Yes, he had bigger production values, fancier costumes, sets, and many people on stage—for sure a different economy in terms of production. But for me, his work still always had the feeling of investigation and experimentation of form, even in the later productions. Moshayedi: Specifically with regard to Cunningham, to what degree are you tied to his legacy and what challenges does your participation in an exhibition of this sort at the Walker pose to the way you conceive of your work? Hassabi: I love his work. I always have, even when I didn’t enjoy being part of the audience. His work lacks any sense of entertainment or concern with being entertaining. That’s one of the things I love about it. My most direct tie to his work, at least for my approach toward this exhibition, is in relation to John Cage and his interest in silence. I find it similar to my understanding of stillness in dance. Moshayedi: The notion of silence, or rather muteness, might also be used to describe the reticence of images. Of course, there is a relationship here to Tacita Dean’s film Merce Cunningham performs STILLNESS (in three movements) to John Cage’s composition 4’33” with Trevor Carlson, New York City, 28 April 2007 (six performances; six films) (2008). This film is interesting in terms of your practice because I think that up until recently your work has been characterized within an art context according to a sculptural logic, one inherently tied to objects and the body as sculpturally bound. In line with your thinking, Dean’s film of Cunningham considers the image of movement rather than fixity of form. 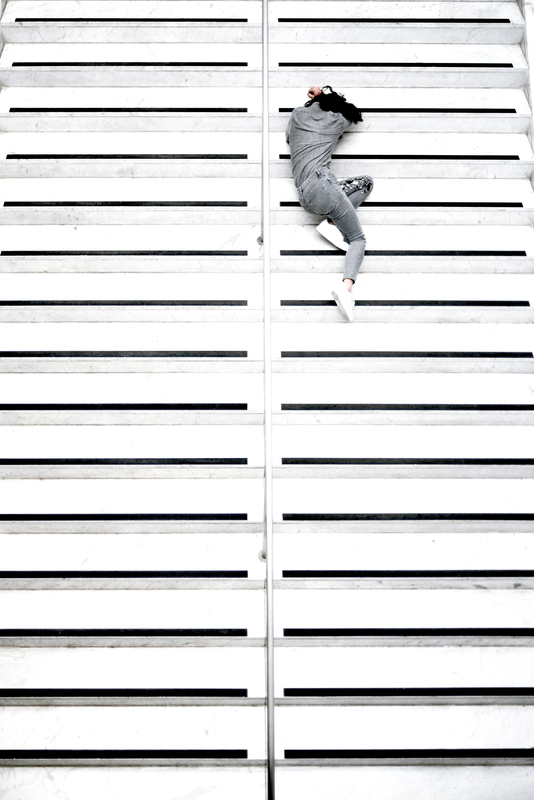 Do you think your new work—particularly in relation to your evocation of Cage and a different idea of what constitutes noise or sound in relation to dance and movement—might start to elicit a new language around your practice? Hassabi: I started making this style of work because I was interested in creating images within live performance. Dealing with how to support images while avoiding easy theatrical tricks—change of lights, change of costumes, etc.—became my objective. Stillness, and a quiet and detailed way of transferring from one place of stillness to the next, was what made sense to me. Yet the more I worked with stillness and precision, the more I realized that what was produced was very sculptural as opposed to being a framed image that is very much bound to its framing. The body in live performance is three-dimensional, and I feel very comfortable with this idea of sculpting the body in each passing instance. I often talk about the paradox of stillness in my performances, because stillness can’t really exist—we are breathing, and even if it’s imperceptible, it’s still a movement. Certainly this is congruous to the paradox of silence as John Cage understood it. I see them as the same concept rendered in different materials. This is something I want to continue pursuing in the new work I’m making for Common Time. What I’m planning to create will be heavily sculpted. It will also be the first work of mine in which I am not performing, and I hope that this will allow me to sculpt every passing second even more, since I will be outside of it. And, yes—I hope I do discover something new. Moshayedi: To date, your works have sought to inhabit different contexts according to specific registers of time—how performers move and occupy space according to the conditions on offer. How much is location a factor in determining the contour and pace of a given choreography? Hassabi: The context of where my works are presented is crucial to how I conceptualize them. For museum works, I’m interested in an ongoing presence as it relates directly to the format in which the other art is exhibited, and one that allows the visitors to continue their patterns of behavior in these spaces. It’s up to the individual visitor to decide what they prefer to view, in what order, and for how long. I find this arrangement much more democratic than asking someone to take a seat in a specific location and watch us for a particular duration. Instead, we (the dancers) are there and fully committed to our product beyond any unscripted interactions that may occur with the visitors. The kind of attention that visitors pay to a live performance changes depending on whether they view it in a theater, a museum, or some other kind of public space. Even so, sometimes the approaches used in a work can be portable across those contexts. For example, on a few occasions I have presented a “theatrical” work—one with a specific duration, a clear beginning and end, a dramaturgical through line, and fixed seating for the audience—in the context of a museum. Pretty much the only thing that changed was the overall color and scale of the piece, due to the switch from black box to white cube. The attention required of the audience remains pretty much the same. Moshayedi: With regard to PLASTIC, how much of the choreography is determined by the conditions of the space when it’s re-performed in different contexts? What were the constants and what were the variables in each of its iterations at the Hammer, the Stedelijk, and MoMA? Hassabi: It was pretty constant, but there were variables due to changes in architecture and crowd flow. A simple example: the difference in the number of stairs at each of these institutions required me to add or cut material from its original presentation at the Hammer. MoMA is a much busier museum in terms of attendance, so for that iteration I also added more performers. 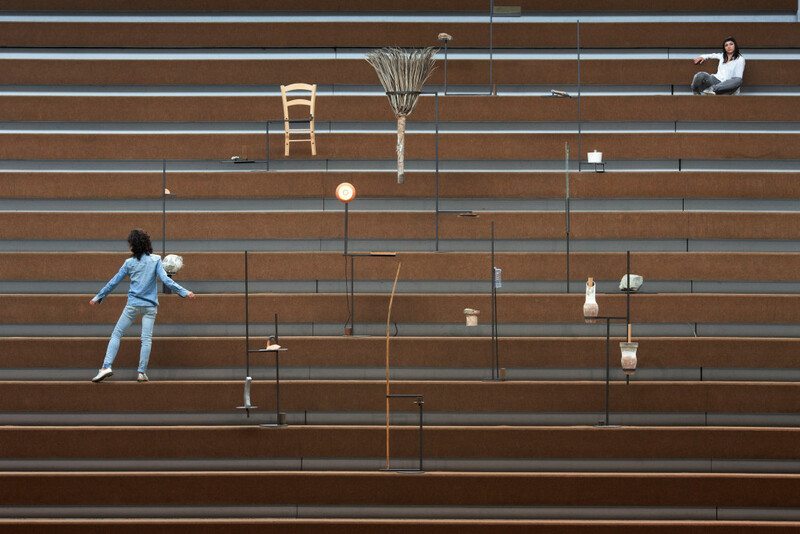 At the Hammer, a very crucial element of PLASTIC was the gallery project—a single dancer, throughout the duration of the piece, who was situated within an installation of sequenced light and sound. Neither the Stedelijk nor MoMA had gallery spaces in the same way, so that aspect of the project was not able to be remounted. But for MoMA, I made a new part for the work, which occupied the atrium area; it was loosely based on the Hammer gallery project. So there were variations, but the overall identity of the work did not shift. Moshayedi: As you moved PLASTIC from one institution to the next, how concerned were you with some idea of an audience and its ability to apprehend, experience, or even just receive the work? Hassabi: There is a through line in all my work, despite the context of presentation. I am concerned with the separation between the spectacular and the everyday, between subject and object, between bystander and viewer—while addressing the ways in which dance and the spectacle of performance are presented in theatrical and exhibition contexts. What shifts are concerns of duration, whether or not there is a clear beginning and ending, and my approach to addressing the audience and our shared intimacy. A good friend mentioned to me awhile back that in theater we tend to treat the audience as a single body, because you cannot consider each audience member individually. In a gallery or an open space, this doesn’t have to be the case. 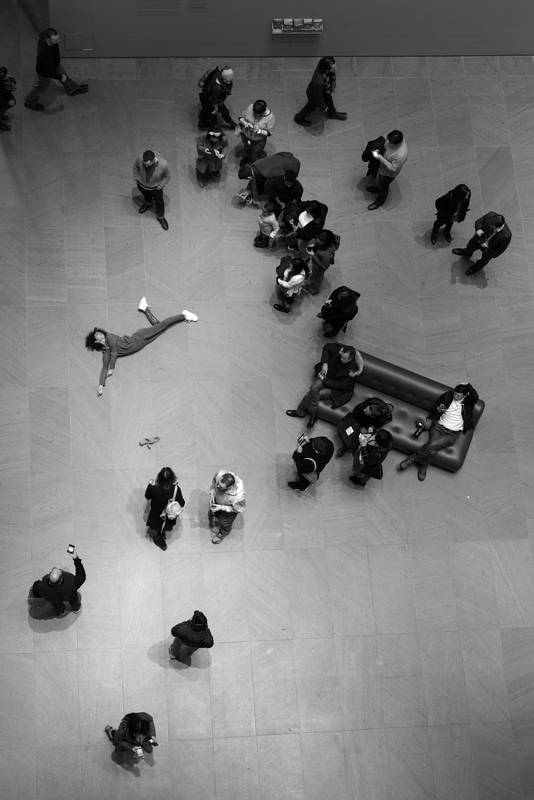 Without a framed beginning and end, the performer is not aware of when visitors enter a gallery, when they pass by, or how they will choose to behave. This changes the intimacy between performer and viewer, and even the work’s intensity and temporality. But in a gallery or museum setting, there’s a feeling at times that we are performing for just one person, or for one body, and I think this can be quite luxurious for both the viewer and the performer. 1 Carrie Lambert-Beatty, Being Watched: Yvonne Rainer and the 1960s (Cambridge, MA: MIT Press, 2008), 60.